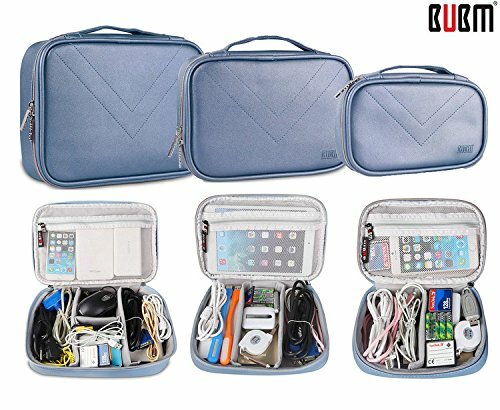 This BUBM bag is well designed for people who need to organize things well when traveling or at home. -- Light With Big Capacity: This bag make full use of the Space. Triple set carry case, large, medium and small. -- Construction: Internal flex wall for electronics accessories storage, adjustable padded dividers. One large internal zipped mesh pocket in the cover. -- Excellent Protection: Well padded semi flexible covers and lining offer excellent protection for your Gadgets. -- Multi-Function: Perfect integration for digital accessories such as power supply, USB flash drive, data cable, charger, camera, cosmetic etc. Material: Durable Waterproof PVC, Brand Zipper. Small- L8.3 * H5 * W2 inches, Weight: 0.35 pounds. 1 * 3pcs/set BUBM Bag (1Large + 1Medium + 1Small). ✔ THREE SIZE (3 in One) - L: 11*8*3 inches, 0.68Lb; M: 9.5*6.7*2 inches, 0.51Lb; S: 8.3*5*2 inches, 0.36Lb. Color: Blue. ✔ SUPER MATERIAL - Made of heavy-duty, Durable and Waterproof Surface. Excellent Protection - Well Padded Semi Flexible Covers and Lining offer excellent protection for your gadgets. Wonderful options for office travel and Gift. ✔ CONVENIENCE - Design with handle, easy to carry everywhere. This storage bags helps you to sort and store your items because of the different compartments and pockets. It is great for being able to see and find all your items. ✔ MULTI-FUNCTION - Home Outdoor Travel Organizer. Can used as Handbag for Smartphone Small Tablet Charger Cable USB Drive Camera, Cosmetic Makeup Case and so on. ✔ ORDER WITH CONFIDENCE - We are responsible for our customers and products, if you are not satisfied with our products, you can return without any reasons.